For most students, enrollment for Spring 2015 is limited to a maximum of 16 units. Graduating seniors will be eligible to register for up to 18 units without a petition on Monday, January 5. Note: Your graduation application must be on file with the Office of the Registrar on or before Monday, November 3, 2014. Note: The excess unit petition is only available for students with a Spring or Fall 2015 graduation application on file. 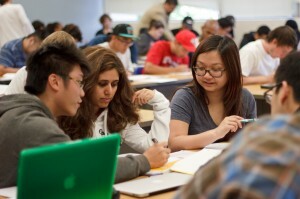 For exceptions, please read your MySJSU message sent out in mid-October. For graduating seniors wanting to take more than 18 units, excess unit petitions will be available on Wednesday, January 7 at Office of the Registrar’s Forms. The maximum units allowed, with petition, is 21 units. Fall 2014 Advance Registration on MySJSU will end at midnight on Wednesday, August 20. Registration will be closed from Thursday, August 21 through Sunday, August 24. You will not be able to add or drop classes during this time. Late registration begins on the first day of instruction, Monday, August 25, and ends on Friday, September 12. Advance Registration for Spring 2014 is from 7 am on Tuesday, November 5 to 11:59 pm on Sunday, January 12. For most students, enrollment for Spring 2014 is limited to a maximum of 16 units. Beginning on November 5, candidates for Spring 2014 and Fall 2014 graduation will be able to register for up to 18 units. You must have a graduation application on file. No exceptions.